Stand up paddling is an outdoor activity that has exploded in popularity in the last few years… and now in Ljubljana it’s going urban. Duncan Rhodes finds out what’s SUP in Slovenia. (Photos and video by Brian Cox). I’m trying to gauge the width of the Ljubljanica river. I think it could be 20 to 25 metres across. Worryingly then, the five metre swimming badge I earned in primary school (still one of my proudest achievements) will not be enough to save me in the likely event that – during my first ever SUP attempt – I take a plunge right in the middle of the waters. “Don’t worry, we have good survival statistics,” Spela from Bananaway had assured me over Twitter, when I mentioned I’m no Michael Phelps. However I would have found a life jacket, or even a pair of comical kids’ waterwings, a lot more assuring. Neither were provided. It’s a beautiful day to be drowning at least. A few scattered clouds mosey around a bright blue June sky, and – this being Saturday – Ljubljana’s residents are out in force, enjoying a beer or three at the innumerable bars and cafes that flank both sides of the river. We are at a scenic spot a little upstream from the Old Town, where you can sit and sunbathe on a series of wide concrete steps by the waters, or shelter under the shade of the weeping willow trees on the grass just behind. Putting aside my aquaphobia for a minute, I’m actually looking forward to trying stand up paddling for the first time… although I’d never imagined I would be doing it right here in the bustling centre of a capital city. Sure I’d seen it in Rio and in Barcelona, but out on the ocean (which a. I definitely wouldn’t try without a life jacket and b. looked a bit boring), whilst a more obvious place for some SUP action would surely be a beautiful lake or untouched stretch of river in the countryside somewhere. But it seems that the innovative LJU-based young company, Bananaway, are keen to kick off a new trend of urban paddle boarding that combines exercise, adventure and sightseeing. …the innovative young company, Bananaway, are keen to kick off a new trend of urban paddle boarding that combines exercise, adventure and sightseeing. It’s time for Matija to take charge of my SUP tutoring and, on the aforementioned concrete steps, we go through a dry run of how to board the board (so to speak) and grip the paddle. So far so good, but it’s the wet run I’m more worried about. I test the temperature of the waters with my hand. Still chilly even in June, but not pneumonia inducing at least. Plus the river flow is lazy, and watching my fellow SUP sightseers paddle off with consummate ease gives me some encouragement that I might yet survive the day. Matija lifts my own board into the water. It’s a sturdy beast, much wider and longer than your average surfboard for example. Once it’s floating on the river’s edge, it’s up to me to tether it to the bank with my foot, whilst sliding my knees, one after the other, off solid land and onto the board. Then, still kneeling, it’s simply a case of picking up my oar and paddling out into the river… I fancy I may even look a bit duck-like as I take to the water like a born natural. The sport is not called “kneel-up paddling” however, and the iron test of course is whether or not I can stand up without taking a bath: but the Ljubljanica is as smooth as a shelf today and it’s another needless worry as I plant my feet on the board with minimum fuss. Despite feeling secure though, for some reason my legs are wobbling like jelly. Could it be the after effects of that night out in Metelkova? “Don’t worry if your legs are unsteady. They soon get used to it,” Matija cries out from across the water, recognising my symptoms as he confidently paddles ahead of me. Having set off last, I’m already behind the group, so it’s time to limber up the shoulders and catch up. There’s a mildly nervous moment when I overextend myself fractionally, and do a little corrective jig, but overall it’s plane sailing. Together we glide up the river, in cruise control, and I’m comfortable enough to only keep one eye on the water and use the other to take in the sights of Ljubljana from my unique (albeit rather low down) perspective. First we pass one of the city’s funky little al fresco libraries (aka Libraries Under The Treetops… full report on these learned treasures here! ), which is set up under some willows not far from where we set off; soon after we pass under the Cobbler’s Bridge, whose famous pillars I’d recently learned (thanks to a private walking tour with Get Your Guide!) were originally intended by starchitect Joze Plecnik to support a roof, but instead, due to a lack of funding, got topped off with lanterns and concrete balls. Next we approach the central Triple Bridge (another of Plecnik’s master designs) which links the old medieval district under the castle with Preseren Square, and here I also get a good view of the pink facade of the Franciscan Church, now blazing orange in the afternoon sunlight. After that, we continue along the river’s trajectory, passing underneath the Vodnik Square on our right, below the span of Butcher’s Bridge, and then under the one-time Jubilee Bridge, where a copper statue of the city’s famous dragon stands guard on each of the arch’s four corners (…and yes, there’s a legend behind this serpentine sentinel). In just around 30 mins we’ve paddled through the heart of the diminutive Slovenian capital, and even if we wanted to we couldn’t go much further as Plecnik’s sluice gate would block our path. In other words it’s time to turn back, and this is where things got a little trickier. We were now paddling upstream whilst a strong wind flew in our faces, and for the first time I began to feel I was having to work out to get anywhere. It seemed like boat traffic increased too, and the wake of each tourist barge threatened to knock me off my board. One did in fact force me to drop back into kneeling position, which at least gave me the chance to splash some cold water from the Ljubljanica onto my face, as the sun and exertion began to take their toll. I was relieved to have pulled back up to dry land without having to test my dubious swimming skills – or the Bananaway crew’s mouth-to-mouth resuscitation techniques. We pushed on, back under the bridges, from which tourists looked down at us, their faces expressing a mix of curiosity, amusement and admiration, and into the final straight home. I wasn’t exactly exhausted but, bearing in mind the 6am finish the night before, I’d definitely had enough for one day. Moreover, I was relieved to have pulled back up to dry land without having to test my dubious swimming skills – or the Bananaway crew’s mouth-to-mouth resuscitation techniques. 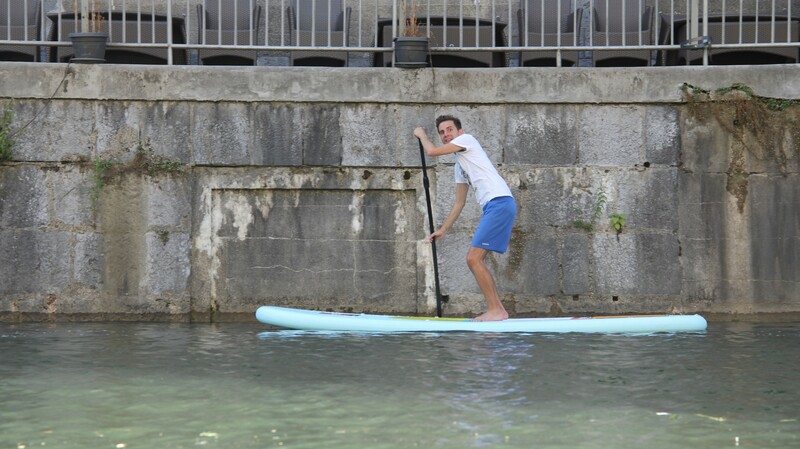 If you fancy trying stand up paddle boarding as a novel way to see Ljubljana then you can contact Bananaway directly, or book their experience via the Slocally website. As well as paddling into the city centre you can choose to paddle away from it too, for a more nature orientated activity, or – if you have the energy – combine the two. 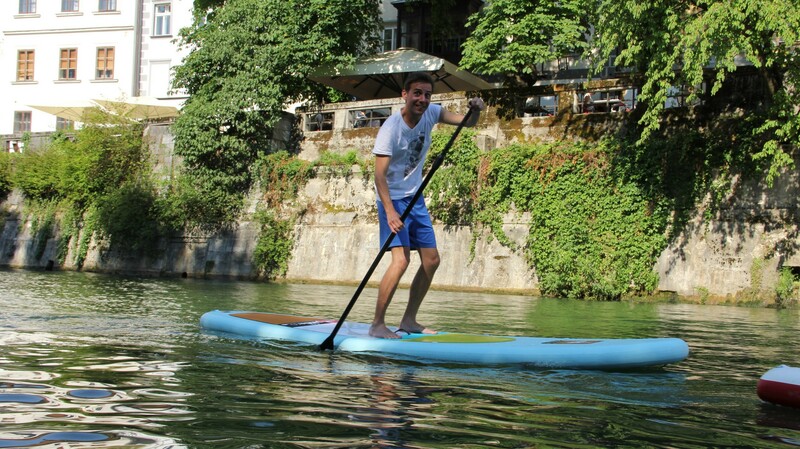 Bananaway also offer SUP in the gorgeous environs of Lake Bled, which is just an hour or so away from the city, plus a range of other outdoor activities in Slovenia and beyond. UPDATE: you can now book SUP at three different locations in the country (LJU, Soca river and Bled) on this page of the Bananaway site! 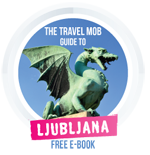 Duncan travelled to Slovenia as part of the #TasteLjubljana blogtrip organised by The Travel Mob blogging team and the Ljubljana Tourist Board – check their websites for more on the city. He stayed at Hotel Meksiko, an affordable budget hotel, with helpful staff, just fifteen minutes walk from Preseren square. He is also grateful to the people of Get Your Guide for setting up a two hour private walking tour, which provided him with plenty of interesting background history, facts and anecdotes, which you will find scattered amongst his Ljubljana coverage. Only on my first attempt… I think on the second my heroic doggy paddle sufficed to win the day! Now there’s a great idea for traveling this summer – if you go someplace with water, get a paddle board! Maria, I dread to think how much Ryanair would charge for you to check in one of those bad boys! They are huge:) But maybe this trend will catch on in other cities with relatively calm, clean and safe waterways… I guess health and safety concerns would prevent it in many countries! I’m up on the very edge (quite literally) of Arctic Alaska – the icepack over the ocean has broken and moved further north but Duncan, our waters are frosty!! !